Arguibel is an intimate manor home in the southwest corner of France, between the Pyrenées and the Atlantic, a few miles from the coastal city of Biarritz. This is French Basque country, and like Italy’s Tyrol, it represents a centuries-old blending of cultures that defies national political boundaries. In the spirit of the region, the Arguibel’s owners have created a fervently eclectic, charmingly eccentric hotel. The neo-Basque façade is bright, copy-paper white, with shutters, balconies, and Spanish roof tiles in deep red set against a backdrop of green countryside. Inside, the first floor serves as the lobby and lounge space, where teal walls complement the vibrant, quirky, mod-inflected furniture. Each of the villa’s five rooms has been designed with a particular theme in mind. Sometimes this manifests rather obviously: the Charlie Chaplin room is decorated in vintage black and white. On the more figurative end of the design spectrum, the “Art of Navigation” is represented by a bed made of driftwood. And modern amenities are well-placed, with iPod docks and free wi-fi available in every room. Breakfast at the villa is at its best in summer, when it’s served on the terrace, and for a leisurely dinner you’ll venture into nearby Biarritz. 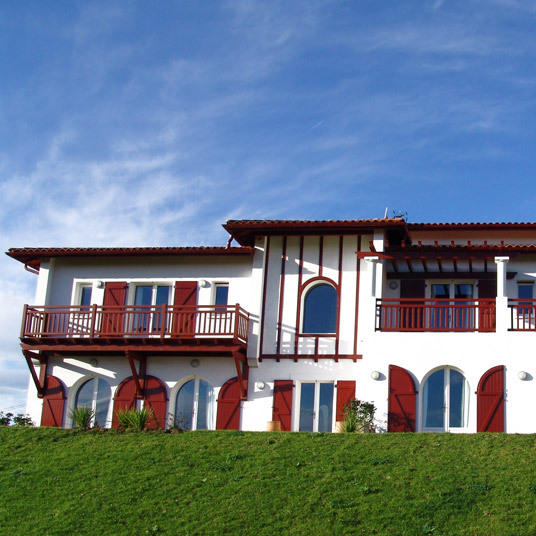 Villa Arguibel is located 4 km from the Biarritz-Parme Airport. If coming by train, the hotel is located 4 km from the Biarritz station and 4 km from the St. Jean de Luz station. Please contact CustomerService@TabletHotels.com for questions and/or assistance with airport transfers.